Let's have some fun now while we check this 'wellness wheel' to see how well you rate when you consider these ten keys to your wellness. Have you thought about just how well you are? Really thought about it, I mean - or have you just gotten used to feeling OK and have forgotten what it feels like to be enjoying vibrant good health. So often, I think, we decide that it's to be expected that we don't feel 'on top of the world' - after all, we are getting older! Just take a few minutes now, and have some fun while you do it, to examine the ten keys to wellness on the 'wellness wheel' and really think about this question of 'how you feel'. 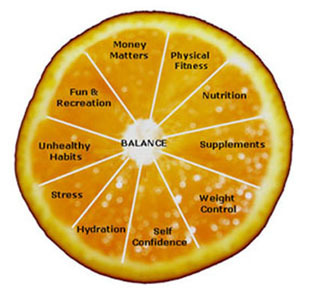 Suppose we take an orange - oranges are very good for us and they do divide nicely into segments - as our 'wellness wheel'. Let's suppose each segment represents one of the ten keys or core elements in our overall plan of wellness. Some would say that there are many more elements to consider but I think if we can get these ten into balance, we'll be doing well and experiencing wellness. Consider carefully each of these segments of the wellness wheel orange, what they each stand for and how you see each segment affecting your life. Where do you see yourself in each of these areas of your life? How would you rate yourself on a scale of 1 to 10? Think about these ten keys on the wellness wheel one at a time. Nutrition is so very important if we want our bodies to function correctly. How are your eating habits? How would you rate yourself? Click on the orange segment at the left to learn about nutrition. Most of us probably don’t feel that we need to take supplements, but even if we are very conscientious about the food we eat, it is still a good idea to supplement wisely. Click to read more. Water is absolutely vital to the efficient functioning of our bodies and most of us don’t drink enough of it. How about you? And, remember 'only water is water'. Those teas, coffees & wines don't count. Never before have we seen such a weight problem in our society. Do you feel happy with your weight?... or are you like most of us, and would like to shed a few pounds? Maybe you have a real problem. There is help available. We all know how important it is to exercise regularly - but do we make the effort? Regular exercise can improve our sense of well-being. Click to find help in this area. Stress is a growing problem in our society and many people suffer health complications due to extreme stress. I hope I can help you in some small way if this is a problem to you. Many people struggle with confidence issues, suffer from a low self esteem and lack self-confidence. There are many strategies available to you that you may find helpful. Just in case you haven’t been able to kick that very unhealthy ‘smoking’ habit – here are a few facts and some tips that may help you. Learn what you are doing to yourself by smoking and how your health will improve once you quit. Do you take time out to have some fun in your life? There are lots of things we can do for recreation and enjoyment - it is very important to include fun and laughter in our life and develop the 'happy habit'. Are you happy with your financial situation or are you always on the lookout for some extra cash? Money does matter especially if it's lacking. Here are some work from home solutions for you. Suppose you decide that as you don't smoke or have any other bad health habits, you exercise regularly and you are very particular about your diet, you rate a near perfect score. Congratulations, you can eat the whole orange segment. If, on the other hand, you know that you should be doing more exercise, you don't take time to enjoy life and you eat far too many takeaways, you will not rate well and there'll be a lot of that orange segment left. Take your time, work your way through each segment, evaluate and decide where you may need some help or where you may need to make some changes. So! What was the verdict? Do you see some room for improvement? ... or is your life in a good state of balance. I hope you've had some fun working your way around my wellness wheel and have been able to identify any areas that may need working on and please do take advantage of the information provided for you throughout this website. I will be continually adding more. free gift with my compliments... BUT... only after you become one of my Wellness Friends by subscribing to my free monthly newsletter. Just fill in the form below. Your details will be quite safe with me. You will receive updates, health tips, bits of fun and health news. You will be given a password that will allow you to access your free gift and allow access to other password protected pages on the site. contact me. Sometimes we just need to talk to someone not too close. Clicking on the link wellness wheel will take you to the Site Directory so that you can continue exploring this site.